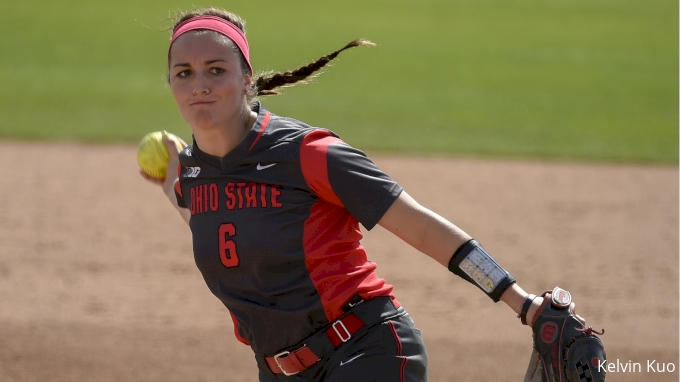 The Ohio State softball team split its doubleheader against No. 21/18 Michigan on Saturday evening at Buckeye Field. The Buckeyes fell 6-2 in the first game before clawing their way back for a 2-1 eight-inning walk-off victory to snap the Wolverines’ 17-game win streak. Ohio State (25-14, 9-5 B1G) handed Michigan (29-11, 11-1 B1G) its first Big Ten loss of the season. Staring down two outs in the bottom of the seventh, Ashley Prange showed off her clutch hitting by drilling a solo home run over right field to tie the game at 1-1 and force extra innings. Bri Betschel beat a 0-2 count in the eighth to bring in the game-winning run with a single to left field. It was a pitcher’s duel that righty ace Morgan Ray (10-6) came out on top of as she tied her career high after tossing eight innings. She let in one run and five hits but responded by striking out a season-high 10 batters.